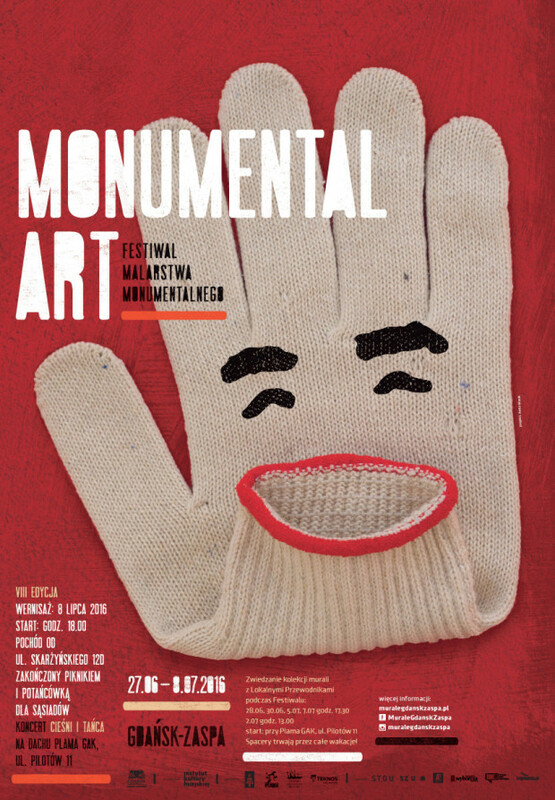 This year’s edition of Monumental Art Festival is made up of four new works expressing Waiting (Oczekiwanie), the idea put forward by Piotr Szwabe, the festival curator. The pieces were prepared by two Argentinian artists: Jorge Pomar, and David Peroni, as well Polish painters: Kamil Kuzko, and a trio of Dariusz Milczarek, Jan Podgórski and Tomasz Prymon from Academy of Fine Arts in Kraków. After the opening, Monumental Art Collection will count 58 murals altogether. Jorge Pomar (Argentina) exploits the notion of a national flag in his works, both the popular ones as well as the flags most of us are not even aware of. a ladder you use at home to fix a lamp in the ceiling. The element common to all the flags is the sun, sometimes pictured as a circle or a round geometric shape. – says Pomar. Some of the flags are popular but few people might realize what the flag of Kiribati country is. The countries represented are 25 in total: Bangladesh, Japan, Uruguay, Rwanda, Kiribati, Argentina, Macedonia, Antigua and Barbuda, Niger, Taiwan, Namibia, Malawi, Kyrgyzstan, Kazakhstan, Tibet, Philippines, Nepal Australian Aboriginal Flag, Ecuador, Biafra, Kurdistan, Afghanistan, Mongolia, Malaysia and Poland. A big sun will be painted in the top of the wall. His work will be created in Pilotów 17 street. - The purpose of this project is to reflect a living trunk with a chromatic coexistence. A growth in space, from earth to heaven. Homage paid to nature. Colors, warm and cold, are presented as a metaphor of the Polish climate. It is important that this living work dialogues with the spatial context it grows within. Geometric shapes are based on fractals that shape every single piece of life that grows on Planet Earth and in the Universe.– comments Petroni. 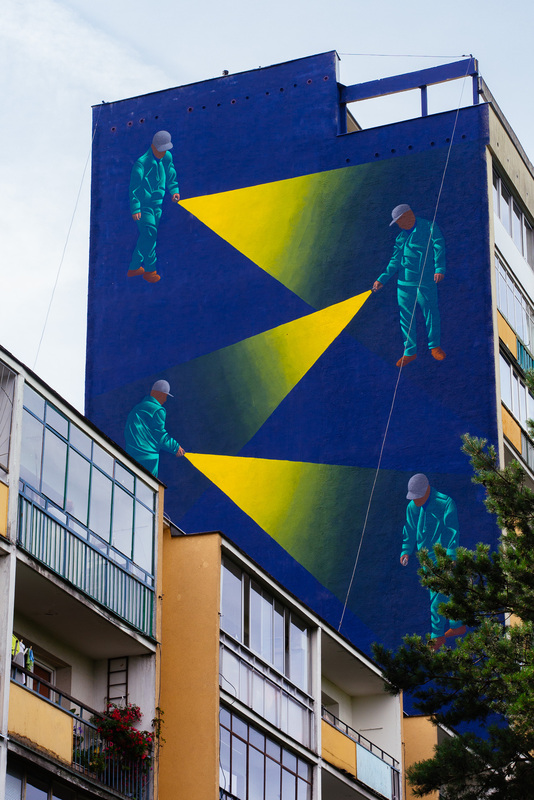 His work will be created in Pilotów 14 street. We will be able to admire Kamil Kuzko’s (Academy of Fine Arts in Kraków) work in Skarżyńskieo 12 street. 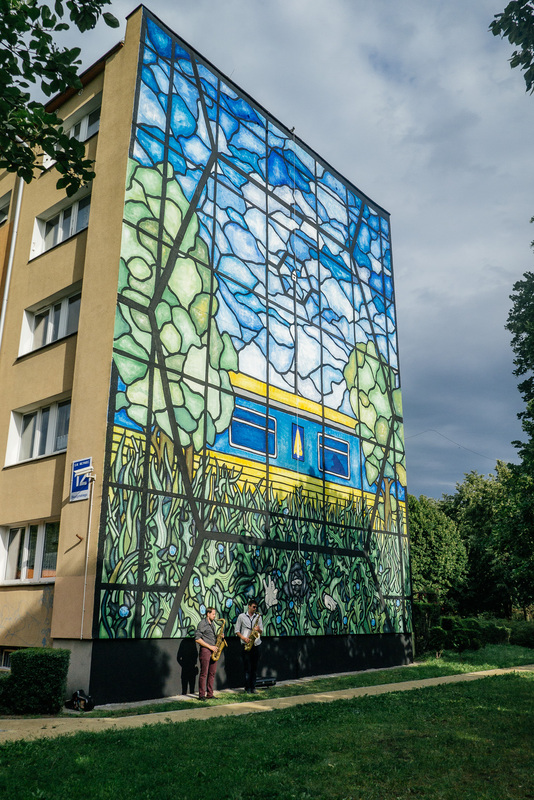 His project refers to the stained glass technique, which hasn’t appeared in the Monumental Art Collection in Zaspa yet. 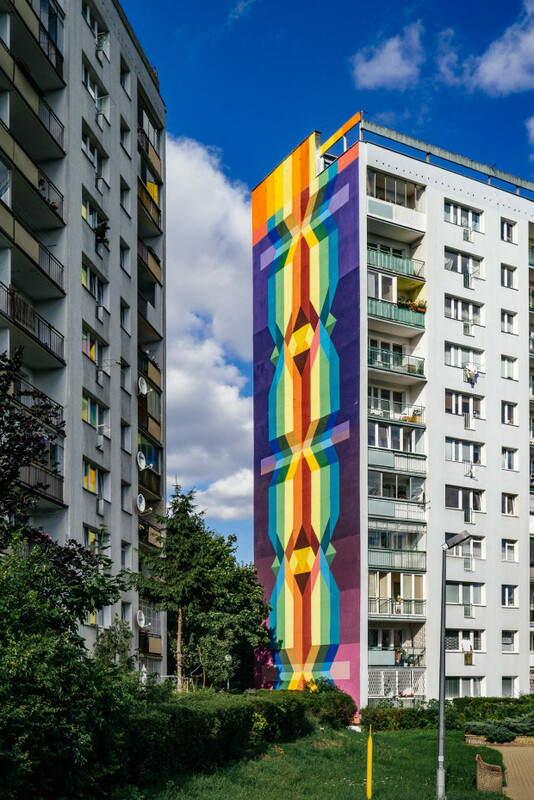 - I based “Stained glass structure” on the hexagonal pattern, which refers directly to the urban plans that the architects Stefan Grochowski and Roman Horodyński based the Zaspa estate on. Horizontal and vertical divisions in the composition relate to the architectural structure. 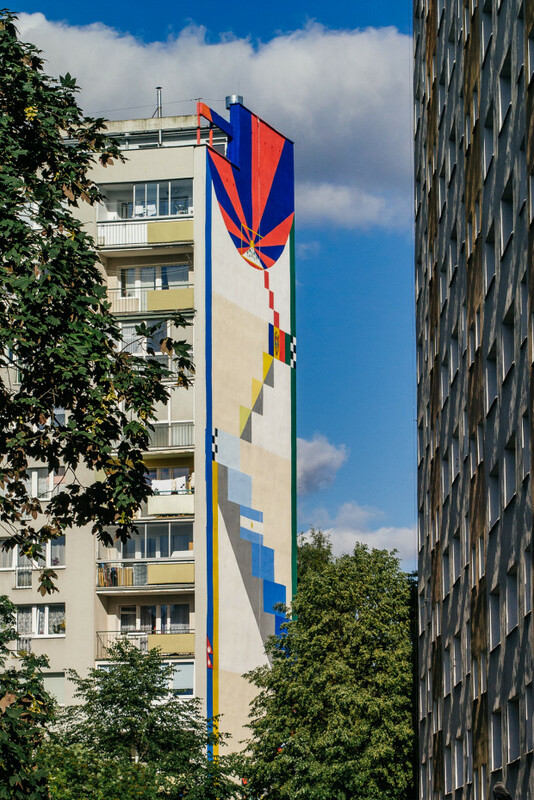 The project takes into account the tree stand, which is located next to the wall, and it influences the colours and height of particular elements. For most of the year (spring-autumn) mural is supposed to merge with space, “glitter”, rather than dazzle. Orange, which appears on the carriage, will be the only strong element – says Kuzko. The last mural won’t be created on the whole wall, but unusually, on its riser in Pilotów 20D street. The project of Dariusz Milczarek, Jan Podgórski and Tomasz Prymon refers to the two of Milczarek’s paintings In the Search of the Simplest Solution and Unsolvable. - Mural shows a figure who multiplies his image by means of light. The figure has no facial features and his next clones have no personal characteristics. The composition has an open structure, we can expect that the process will continue on and on, and there are new images being created behind the frame. This view attempts to serve as the reflection upon our lives in the times of the Internet. Using social media, we create our own reproductions and we expect to be assumed instead – here I am. We post the copies of our virtual self and wait to get some attention – comments Dariusz Milczarek.